It is my pleasure to publish this guest post by Tim Cullen, an independent solar system researcher. His previous post here didn’t get the attention it deserved due to the other events occurring around the same time, so take a look at that too. Tim Cullen has generously given me permission to add a link to a full pdf copy of this article. Please disseminate it widely. 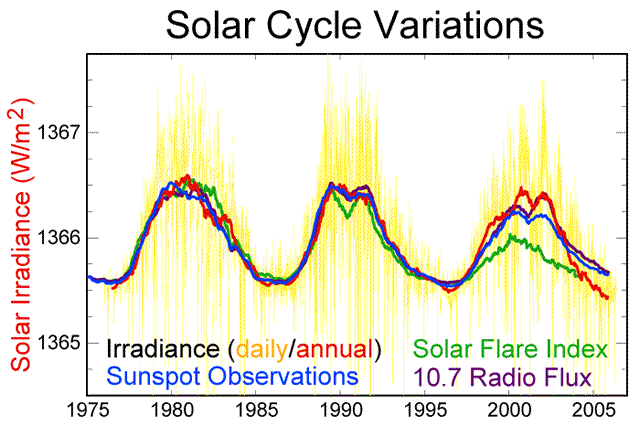 Scientists have been using satellites since 1979 to measure Total Solar Irradiance. 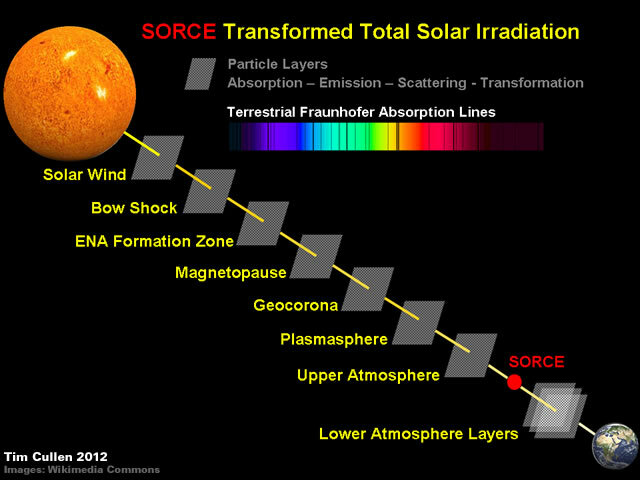 The Solar Radiation and Climate Experiment (SORCE) is a NASA-sponsored satellite mission that provides state-of-the-art measurements of incoming X-ray, ultraviolet, visible, near-infrared, and total solar radiation. SORCE measures the Sun’s output with the use of state-of-the-art radiometers, spectrometers, photodiodes, detectors, and bolometers engineered into instruments mounted on a satellite observatory. The SORCE satellite orbits around the Earth accumulating solar data. It will continue the precise measurements of total solar irradiance (TSI) that began with the ERB instrument in 1979 and has continued to the present with the ACRIM series of measurements. SORCE will also provide the measurements of the solar spectral irradiance from 1nm to 2000nm, accounting for 95% of the spectral contribution to TSI. Everyone is agreed: SORCE provides precise state-of-the-art measurements of TSI. Even the Climatologists think the data is perfect. Wikipedia thinks it’s so perfect they include the data in their Global Warming article. It’s a problem for scientists. It’s a mortal blow to climatologists. The first clue is provided by Wikipedia in their Sun article. Very helpfully Wikipedia included a graph of Extraterrestrial Total Solar Irradiance. a black body of the same size must have to yield the same total emissive power. The Sun’s Photosphere has an effective temperature of 5,778 K.
Therefore, the Photosphere’s Irradiance Spectrum should be equal to the Irradiance Spectrum of a Blackbody at 5,778 K.
Unfortunately, a funny thing happened to the TSI on its way to the SORCE satellite. TSI lost a lot of high energy ultraviolet. TSI gained a lot of visible light. TSI gained a lot of low energy infrared. Something absorbed ultraviolet and then emitted visible and infrared. SORCE is not precisely measuring TSI. SORCE is precisely measuring Transformed TSI. This all seems very strange on first inspection. Climatologists will immediately wave they hands and say this is pure nonsense. Scientists will look for an explanation. But there is a very embarrassing explanation. The explanation is very clearly stated. So what’s wrong with a 645 kilometre orbit? Everything if you are trying to precisely measure TSI. Because the SORCE satellite isn’t above the Earth’s atmosphere! 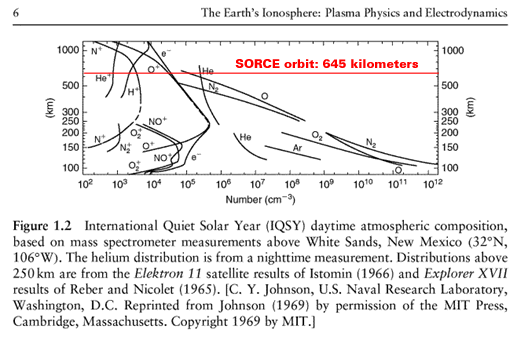 SORCE is orbiting about 90,000 kilometres below the top of the Earth’s atmosphere. Still not convinced there is a problem? Still think we can just disregard the atmosphere above 645 kilometres? There is a lot happening above 645 kilometres. Let’s start with Hydrogen doing something naughty in the geocorona. The geocoronal X-rays are caused by collisions of heavy ions of carbon, oxygen and neon in the solar wind with hydrogen atoms located tens of thousands of miles above the surface of Earth. During the collisions, the solar ions capture electrons from hydrogen atoms. The solar ions then kick out X-rays as the captured electrons drop to lower energy states. Wikipedia tells us that Hydrogen emits ultraviolet light in the geocorona. The geocorona is the luminous part of the outermost region of the Earth’s atmosphere, the exosphere. It is seen primarily via far-ultraviolet light (Lyman-alpha) from the Sun that is scattered from neutral hydrogen. Hydrogen emits visible light and ultraviolet light when it collides with an electron. When an electron has an inelastic collision with Hydrogen the excess energy that has been transferred to the Hydrogen may be partially emitted as a visible sky-blue photon. The Hydrogen may then emit the remaining excess energy as a photon in the ultraviolet spectrum. Helium+ is detected well above 645 km via its ultraviolet emissions at 30.4 nm. Let’s add some Oxygen into the mix. Hydrogen+, Helium+ and Oxygen+ are transported well above 645 kilometres. These particles will emit ultraviolet and/or visible light when they have an inelastic collision with an electron or recombine with the electron to form a neutral particle. The neutral particle will then be ionised by solar radiation and restart the cycle. Alternatively, they might just absorb a lot of insolation and emit infrared radiation. Another important aspect of the ionosphere-magnetosphere interaction is the outflow of plasma from the ionosphere into the magnetosphere. upward ion conics and beams from the auroral zone. In addition to these high-latitude sources, strong O+ outflows from the mid-latitude ionosphere have been observed at times of intense geomagnetic activity. The strength and composition of the ionospheric plasma outflows vary with geomagnetic activity, season, solar cycle, local time, and altitude. For example, the O+ component of the ionospheric outflow increases with increasing solar and geomagnetic activity, with a corresponding increase in the O+ density of the plasma sheet. The atmosphere above 645 kilometres is not densely populated. But there is about 90,000 kilometres of it above the orbiting SORCE satellite. Unfortunately we don’t know all the details. The atmosphere above 645 km absorbs high energy ultraviolet. The atmosphere above 645 km emits a lot of visible light. The atmosphere above 645 km emits infrared. Lurking beneath this whole TSI fiasco is a dirty little secret. It’s a dirty little secret that climatologists definitely don’t want you to know. The atmospheric transformation of energy is clearly detectable at ground level. Even climatologists could detect the transformations if they weren’t so busy fudging the data and playing with their computer models. One measurement when the sky is clear. Another measurement when the sky is cloudy. Clouds absorb UVB and emit visible light and infrared radiation. Sir David Brewster (1836) found that certain lines had strengths that varied with the sun’s elevation and with the seasons. He correctly ascribed these ‘atmospheric lines’ as originating in the terrestrial atmosphere. Unfortunately, these variable atmospheric absorption lines [in the solar spectrum] seem to have been written out the official scientific script. Atmospheric transformations are not fully understood, identified or quantified. SORCE is measuring Atmospherically Transformed TSI. Climatology’s “Energy Budget” science is wrong. Climatology’s “Greenhouse Effect” science is wrong. Climatology’s “Global Warming” science is wrong. Science needs to rediscover the work of Sir David Brewster. Thanks for a clearly explained post. Note in addition that as far as I know all GCM models still use TSI= 1367 watts/m2 and NOT the latest SORCE value of 1361 watts/m2. This does effect the results of model runs – for example the climate sensitivity – see http://clivebest.com/blog/?p=3681. The SORCE satellite is in very serious technical trouble, is operating in degraded mode after battery cell failure. The web site is largely stale. IIRC a number of staff left. Does that give more clues? I also question what it actually measures and the accuracy without needing T Cullen’s excellent article. (easier to use surname, I am another TC) Very little hard technical data is available on the TSI instument, why? On the issue of the SORCE battery failure, and the gap in data which is now threatening our knowledge. I just find this incredible. Accurate measurement of Solar irradiance, even as filtered through some of the (rapidly changing) upper atmosphere is incredibly important. Yet solar science has been badly neglected for funding due to the dogma of the IPCC and the heavily flawed climate ‘science’ which writes the Sun and its variability off as unimportant in determining Earth’s energy balance. Tim (either one! 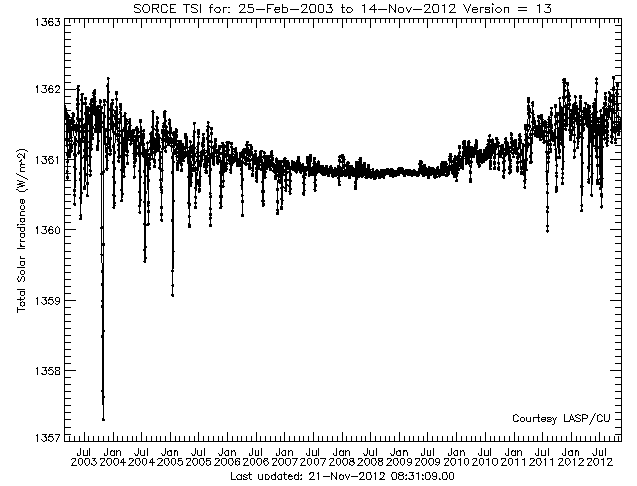 ), in the Venus transit graph in the SORCE newsletter, what is the explanation for the “U”-shaped TSI graph? At first sight, given the size of Venus relative to the disc of the sun, I would have expected more abrupt changes during at the beginning and end, and flatter during the bulk of the several hours of the transition. Is it due to movement by the satellite? Typo: Climatologists will immediately wave their hands. in the Venus transit graph….what is the explanation for the “U”-shaped TSI graph? The U-shape is a measure of the Sun’s spherical shape…. Very little hard technical data is available on the TSI instrument, why? You might find this interesting… but then again you might not…. 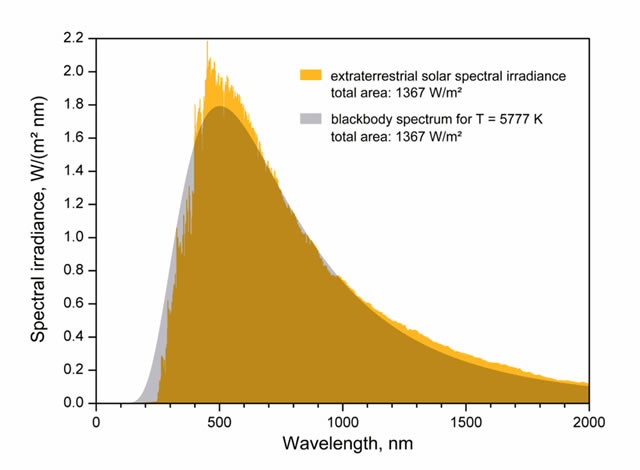 Wehrli, C. “Extraterrestrial Solar Spectrum”, Publication no. 615, Physikalisch-Meteorologisches Observatorium + World Radiation Center (PMO/WRC) Davos Dorf, Switzerland, July 1985. Neckel, H. and D. Labs “Improved Data of Solar Spectral Irradiance from 0.33 to 1.25 um”, Solar Physics, Vol 74, 1981. The orange plot IS the solar spectrum. It does not have to conform to black body (there are many missing lines and the average temperature may be 5778K but there will be a spectrum of temperature present each adding there own “BB” radiation. There is also another AM0 based on satellite stuff. Do you think that the transformation of energy within the atmosphere could alter the vertical temperature profile of the atmosphere differently at different heights ? In particular I have in mind effects on the balance between creation and destruction of ozone in the stratosphere and mesosphere. I have suggested elsewhere that changes in that vertical temperature profile would be capable of driving changes in climate by altering the behaviour of the polar vortices so as shift climate zones latutudinally, change global cloudiness and thereby change the amount of energy getting into the oceans to fuel the climate system. “Clouds absorb UVB and emit visible light and infrared radiation”. That casts a new perspective on the DWIR issue too. I would have thought that the scale of such an effect from clouds would be magnitudes higher than any similar effect from human sourced CO2 molecules. However UVB gets into the ocean if it gets past the clouds whereas visible light and infrared do not get into the ocean so there we have a new way that clouds could cause net cooling by stopping energy from entering the oceans. The residence time of the transformed energy within the air would be far shorter than the residence time if the UVB had entered the oceans. Global cloudiness has been increasing since around 2000. A real can of worms here. I am unclear on the practical problem with the atmospheric change of incoming SI. What is important to the energy balance of the Earth is the magnitude (and changes) of incoming and outgoing energy at some “reasonable” altitude. 645km seems like a reasonable height, as the mass of the atmosphere above that is proportionately inconsequential. The climatologists/atmospheric physicists might now be forced to amend their idea of the TSI in the Earth-Solar volume, and may have to say that their work reflects what is going on under 645 km, but that is nitpicking. What I find more significant from a SI perspective of the Earth’s energy balance, is the Moana Loa Apparrent Transmission Preliminary at the above link (from WUWT Solar info site). A crude line I drew on this showed about a 4% drop since 1979. The negative peaks I understand are from volcanic eruptions, but what of the time-dependent, linear and progressive drop? Chinese air pollution? The 645km-TOA-TSI (let’s call it 645TSI) on which this article was made shows an INCREASE from a peak of mid-2003, while the Apparent Transmission shows the decrease continuing through that time to today. These two observations (if valid) go against each other, unless whatever is reducing transmission is increasing faster than the increase in 645TSI. My ignorance in many things amazes even me. Perhaps I misconstrue or misunderstand. It does not have to conform to black body (there are many missing lines and the average temperature may be 5778K but there will be a spectrum of temperature present each adding there own “BB” radiation. But you are viewing it through an intervening medium… that’s the problem. Its like counting the passengers as they get off a train… you can count them… but you don’t know how many passengers were on the train when it started out… or how many passengers left the train en route…. and you don’t know how many got onto the train during its journey. It’s exactly the same problem with the solar spectrum. If we measured the solar spectrum well above the Earth’s atmosphere… lets say 150,000 km… them we could compare and contrast the 150,000 km spectrum with a ground based spectrum… this would help us understand what is being absorbed and emitted in the Earth’s atmosphere… and it would give us a better handle on the “top of atmosphere” TSI… and a better understanding of the Solar spectrum… but not a perfect one… there is still a lot of intervening medium between a 150,000 km Earth orbit and the photosphere. However, we can still make a lot of progress using terrestrial readings… that’s the beauty of Sir David Brewster observation that certain lines had strengths that varied with the sun’s elevation and with the seasons… science can easily get a handle on these variable bands… they can even track then during the day to get a better understanding of the atmosphere and the weather… and monitor them during geomagnetic storms… it wont be perfect… but there is a lot we can learn. Do you think that the transformation of energy within the atmosphere could alter the vertical temperature profile of the atmosphere differently at different heights? The surface is a heat transformation engine… driving convection and turbulence… and the terrestrial lapse rate works until you get to about 12 km… then photodissociation kicks in and we get the straight line temperature profile up to about 20 km… lots of H2O getting separated… this puts H into the atmosphere… and some extra O to juice up the ozone production… then ionisation kicks in and the temperatures starts to rise again and the lapse rate reverses… then some extra ionisation and the reversed lapse rate accelerates… and so it goes on up through the layers of the atmosphere… lots of absorption… lots of emissions… lots of transfers… lots of transformations. The big problem is we can only see H2O when it has condensed… radio propagation gives us some clues… and electrical events… and the solar spectrum… and balloons… and satellites… we should really know a lot more that we do… but we don’t because we are knee deep in Ozone Hole and CAGW post-normal junk science. Overall: It’s a very exciting challenge. Tim Cullen: SOHO was parked out in a halo orbit near L1, about 1.5m km from Earth. Didn’t that mission team do any spectrographic analysis of the Sun? Don’t we have any instrument on geostationary orbit? If we have one, what’s the difference? If not, why not? 645km seems like a reasonable height, as the mass of the atmosphere above that is proportionately inconsequential. I wouldn’t because I prefer to understand a system holistically. HOWEVER: You must do your energy budget properly. 1) Quantifying all the electromagnetic radiation crossing that arbitrary boundary in both directions. 2) Quantifying all the particles [and their energy] crossing that arbitrary boundary in both directions. The post-normal kindergarten energy budget ignores particles [with their charge and their thermal energy and their kinetic energy] entering and leaving the system. It ignores ultraviolet and visible light leaving the system. It uses strangely calculated averages when the system actually runs in real time. It assumes [wrongly] that the system is in equilibrium. It assumes [wrongly] the system always works the same regardless of flow rates. But let’s assume you get over all those issues and do it right. SO NOW YOU HAVE AN ENERGY BUDGET. You know what goes IN. You know what goes OUT. BUT you know NOTHING about the PROCESSES. You know nothing about the FLOWS, TRANSFERS and TRANSFORMATIONS. Therefore, you have NO PREDICTIVE capability. But you might have a pretty diagram to take to the post-normal kindergarten. Didn’t that mission team do any spectrographic analysis of the Sun? However, I haven’t stumbled across one on the internet. Given the atmosphere has changed in size it’s density out there must have changed. Can anything be gleaned from this? I can use your work to support the likelihood of my propositions. Yes, it is integral to the changes in atmospheric heights needed to explain latitudinal shifting climate zones and the alteration of the amount of energy into the ocean. As TC points out the system responses are woefully uncertain at present. In particular, observations tell me that the standard clomatology anticipating the same atmospheric response to solar changes throughout the atmospheric column must be wrong. For the observations to be applicable we need a reverse sign response in the stratosphere and mesosphere. Some indication of that being so was the finding that from 2004 to 2007, whilst the sun was getting weaker, ozone amounts above 45km actually increased despite expectations to the contrary. Fingers crossed, but I may have hit the nail on the head with my earlier articles. Given the atmosphere has changed in size it’s density out there must have changed. That’s looks so small… but the units used are very small… 1/100 of a square cm… 1/10 of a second… so I did another back of fag packet calculation… applying that loss rate to the terrestrial surface area gives a hydrogen loss rate of 4,620 tons per hour… but the agreed loss rate is quoted in relation to the Exobase… which ranges between 500 and 1000 km… so we could be looking at between 5,374 and 6,184 tons an hour… now that is a lot of hydrogen… and a lot of it coming from the photodissociation of water… that’s a lot water [i.e. H and 2O] being loss each year… and we only have a rough figure for the hydrogen loss… nothing for oxygen… and there is a helium loss to add onto the figure. Overall the Earth Sciences are really in a mess… no wonder they don’t want anyone to see the real numbers or the processes… the Earth is evidently outgassing vast amounts of Hydrogen… and Oxygen by the looks of it… lots of the outgassing is recombining to form water… the water dissociates in the atmosphere… heated and ionised they get blasted up into the magnetosphere… my guess is a lot of this material gets blown into the magnetotail… and then leaves the Earthly domain for space. Bottom line: there is a lot more to this story… a lot more to discover. The failure of the GLORY satellite launch last year is the reason SORCE is still in play. Tim Seems to describe old, forgotten (and new hidden?) problems. The state of the art in 1980 might be of interest. and instrumental limitations, a definitive answer has remained elusive. from very different scientific backgrounds and use very dissimilar techniques. of the solar constant, and thus check the validity of each other’s results. the 7th of November 1980. According to Emmert and colleagues, low solar EUV accounts for about 30% of the collapse. Extra CO2 accounts for at least another 10%. That leaves as much as 60% unaccounted for. The height dependence of the mass density anomalies suggests that they are attributable to a combination of lower-than-expected exospheric temperature (−14 K) and reductions in the number density of atomic oxygen (−12%) and other species (−3%) near the base of the diffusive portion of the thermosphere. Does insolation or the Solar Wind [or both] drive UV variability? We need to separate three issues. The variation in UV leaving the Sun. If your thoughts are in the right direction, there may be an amplification mechanism in play which will change our views on solar-terrestrial effects due to solar variation. solar minimum is the first step toward the modeling of the EUV variations. The best known approximations to a black body is a cavity with only a small hole to allow the radiation to escape. The sun is not a good approximation to a black body. CO2 alarmists forget that the surface of the Earth (jungles, deserts, oceans, glaciers, fields) is also not a good approximation to a black body. Not preconceived ideas embedded into ‘Solar Modeling in 3D’ computer code. Looks like another missed opportunity to re-discover the work of Sir David Brewster. The sun is not a good approximation to a black body. When we have unravelled all that we might be able to say that the sun is not a black body… at the moment we are lacking evidence to support that view… unfortunately astronomers chose to ignore Sir David Brewster… climatologists have following their lead… and both groups are currently in a mess [to put it politely]. I also believe that the Sun is the primary source of energy entering the Earthly domain… but I think the input comes in two main streams: Insolation and the Solar Wind… the problem climatologists have is they don’t acknowledge all the input and all the outputs… so their models are wrong… they don’t know anything about the energy and matter transformations that occur within the system… they don’t know about all the sinks and releases of energy in the system… they incorrectly assume the system is in equilibrium… so they really don’t have a clue about the energy budget, or the greenhouse effect or global warming…. and the icing on the cake is that all this ignorance is called “settled science”. “The Sun’s Photosphere has an effective temperature of 5,778 K.
This conclusion does not follow from the assumption. The sun is NOT a black body at 5778K, and therefore would not be expected to have a spectrum exactly matching. 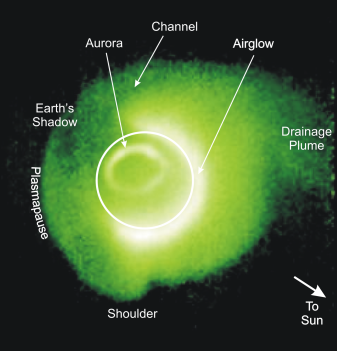 The light from the sun comes partly from some areas below 5778K (like the upper photosphere and chromosome) and partly from some areas above 5778 (like the deeper layers of the photosphere). I don’t know off-hand what the actual spectrum coming from the sun is, but is it assuredly NOT the 5778K blackbody spectrum you are assuming it must be. “SORCE is not precisely measuring TSI. Yes, I am still not convinced this is a problem. TSI is the irradiance measured at the earth – not at the sun or Venus or moon. Whatever transformations happen before arriving at earth would be part of what shapes the TSI. You make a good point that the TSI would be different at 0 km or 100 km or 645 km or 10,000 km. Apparently the TSI is now defined specifically as the irradiance at 645 km — call it “TSI(654)”. TSI(10,000) would be slightly different (but not too much). TSI(50) would also be a little different. Can you show that the spectrum changes significantly from 10,000 km to 100 km? 2) Why does it matter ON EARTH where above 100 km the changes occur? The only thing that is evident to me is that clouds absorb UVB, but not that they emit visible light. I think you may be misinterpreting the graph. The curves are all normalized to give a maximum intensity of 1. So the sunny sky would be most intense at ALL wavelengths, but it was scaled back for easier comparison. The clouds are not “creating” any visible light, they are simply block the UV more efficiently than they are blocking the visible light. If you look at the reply Tim Cullen gave to ‘TheFordPrefect’ earlier, you’ll see that Tim C is well aware of the issue, but correctly points out that we don’t have access to empirical data to be able to tell what departures from the BB spectrum are due to variations in the temperature of the Solar photosphere, and which are due to absorption and re-emittance (or not) of energy passing through that part of the Earth’s atmosphere which is above the orbit of the satellites taking measurements of solar output. Yes Tim Cullen but the sun also has an atmosphere and what is emitted at the corona or visible projection is different to the emission at the core surface which can not presently be measured. The very fact that sun spots can be noted means that emission from the core and from the visible projection means that there are variations in energy output particularly in very short wavelengths and as quantum particles. By definition (and original experimentation) the S-B formula applies only to surfaces in a vacuum. We know nothing of the sun’s surface (ie its core) and the surface is not in a vacuum. Beside that there is the question is the Planck distribution correct? Tim, you may not be aware of this, but there are some serious problems with the theory of how clouds modulate incoming energy, possible due to inadequate representations of Mie scattering. This is not a small problem. When the USAF flew planes above and below the cloud deck simultaneously taking readings, they found that the clouds were radiating 40W/m^2 more than theory expected. 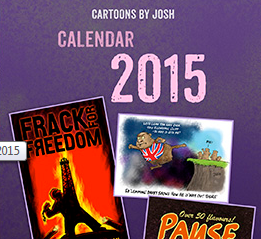 Trenberth’s energy budget is a bad joke in poor taste. Can the climatologists claiming to have the energy budget nailed down to within a watt show that it doesn’t? The solar spectrum changes [at ground level] depending upon cloud levels. Specifically: Clouds appear to convert UVA into visible and infrared. Sir David Brewster found spectrum changes associated with the sun’s elevation. Sir David Brewster found spectrum changes associated with the seasons. Hydrogen in the Geocorona emits X-Rays after colliding with the Solar Wind. 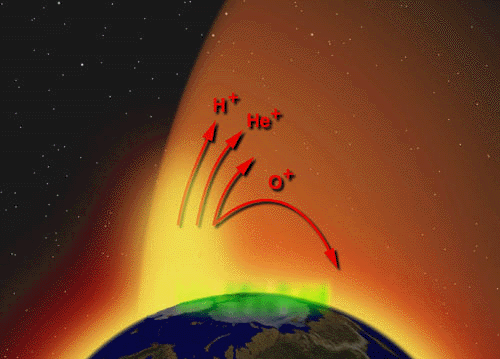 Hydrogen emits Ultraviolet and Visible light in the Exosphere. Helium emits Ultraviolet in the Exopshere. 1. Ground based “solar spectrums” are modified by the Earth’s atmosphere. 2. Satellites within the Earth’s upper atmosphere suffer the same problem. 3. Even the satellites outside the Earth’s atmosphere have a problem with their “solar spectrums” because they are receiving insolation after it has travelled through the solar system atmosphere [which is predominated by Solar Wind particles]. Therefore we don’t actually know whether the Sun radiates as a black body [or not]. Interestingly, looking at a ground based “solar spectrum” we see visible light and infrared emissions above that predicted by a black body spectrum. 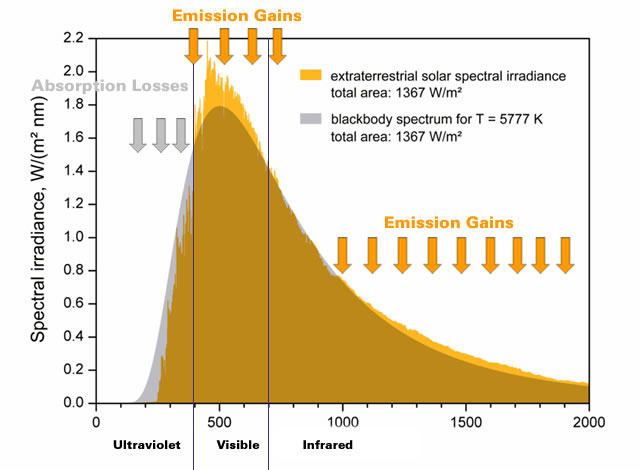 These emission gains are offset by a loss in the UV spectrum predicted for a black body. This actually implies the Sun is radiating as a black body! Astronomers chose to ignore the observational evidence of Sir David Brewster [and the accumulated “solar spectrums” evidence] and issued a decree that the Sun is not a black body. Unfortunately, for them, science is not done by decree. Well, I think that’s going too far. I think what it implies is that the overall emission energy from the Sun is such as that it is equivalent to a black body radiating at 5778K. However I agree with Tim F that various emission temperatures will make up the spectrum, because we can see the Sun is not perfectly homogenous, which implies parts of it emitting radiation which reaches us are at different temperatures. How much that non-BB spectrum is further modified by Earth’s atmosphere between 645km and the Sun is the unresolved issue. Well, I think that’s going too far. Fair comment but I’m keeping my options open… because terrestrial observations suggest a trade-off between “absorption losses” and “emission gains”… but I definitely agree that we have insufficient data to make a call [either way]. [the sunspots might even be revealing the surface of the Sun – we just don’t know]. Yes the quoted 5778 K photosphere temperature is not precisely accurate across all of the photosphere [all of the time]… it probably varies just like the Transformed TSI varies… so the number is not precise… it is a generalisation… and [in a similar manner] we might find the photosphere radiates very much like a black body… with the emphasis on photosphere… time will tell. The bottom line [for me] is that [as a generalisation] “Climate Science” and “Solar Science” both suffer from the same post-normal delusional belief in “settled science”. But Tim don’t forget Wien’s displacement. Notice that the maximum peak emission is right about 485 nm and at that maximum the temperature is not 5778 but something like 2987/.485 or ~6000 K. There are 6000 K lamps to match the sun’s color more critically. I’ve always viewed this that the sun is not a true blackbody, nothing is, it has an emissivity, and they have line-by-line measured the radiance and then computed the equivalent brightness temperture to be 5778 K. That would put the emissivity at about 0.96-0.97 and most lines show some absorption. Opps, just realized something, that .96-.97 emissivity is not correct, forgot taking the fourth root, try ~0.992 or so instead. Of course we know it is not radiating as a black body! if nothing else, “limb darkening” tells us it is not a BB. The temperature of the star diminishes as the distance from the center increases. If the temperature changes, then it is clearly not radiating as a single black body radiating at a single temperature. Certainly the atmosphere in between modifies this spectrum, but again, I am not sure why this is so important. As long as the modification is fairly consistent, then we know the spectrum at the top of the atmosphere. We can use the “too-much-visible, too-much-IR, too-little-UV” spectrum and have a pretty good idea about the incoming light. Now, if the climate models specifically assume the light is 5778K BB radiation, then there could be problems, since we know it has extra IR and tool little UV for such a BB, and that could affect how the energy ACTUALLY gets absorbed compared to how the energy is MODELED to get absorbed. I don’t know what the models assume, nor what errors this might introduce. Tim C, when you said “Clouds absorb UVB and emit visible light and infrared radiation.” are you implying some sort of fluorescence, where UV is converted to visible light by clouds. Tim C, do you think such a fluorescent transformation of energy by clouds is what makes the “Cloudy” line on the graph rise above the “Clear” line from 500 – 2000 nm? [Reply] You already pointed out the different scaling of the clear/cloudy plot curves, so knock it off with the trick questions. “[the sunspots might even be revealing the surface of the Sun – we just don’t know]. WHAT??? Revealing the “surface of the sun”? What sort of surface do you imagine??? [Reply] Which part of “we just don’t know” don’t you understand? Certainly the atmosphere in between modifies this spectrum, but again, I am not sure why this is so important. Max says: “Jupiter doesn’t vary much dayside or nightside, Saturn doesn’t, Uranus doesn’t, Neptune doesn’t. AH! Now a major misconception has become clear. The “gravitational compression” associated with gas planets is related to the continued shrinking of the ENTIRE PLANET (with the exception of a small solid core). The gravitational potential energy of the gas actually moving in toward the center of the planet gets converted to heat. Only the continued contraction of the planet will cause continued heating of the gas. (This is the same process that initially heats stars hot enough for nuclear fusion to start). On a planet that is mostly solid (or liquid), there is no continued shrinking that converts gravitational potential energy into thermal energy. Jupiter & Saturn continue to get smaller! Venus & Earth do NOT continue to get smaller! There are 6000 K lamps to match the sun’s color more critically. When I first looked at the “clear sky” spectrum “critically” I was way above 6,000 K.
Wien’s displacement law states that the wavelength distribution of thermal radiation from a black body at any temperature has essentially the same shape as the distribution at any other temperature, except that each wavelength is displaced on the graph. Personally, I wouldn’t call the blackbody distribution curves “essentially the same shape”… but no matter… they are smooth, curved and asymmetrical. The “standard solar spectrum” has lost it’s a lot of smoothness – especially at the Ultraviolet end of the spectrum… I take this to be indicative of absorption because it is below the notional blackbody curve… the Visble spectrum has also lost its smoothness and it is curiously way above the blackbody curve… I take this to be indicative of the absorption of UV and the emission of visible light [i.e. a transformation]. However, if you compare the “clear sky” and “cloudy sky” spectrums “critically” [without knowing where they came from] then [I think] most people would conclude they related to two different sources. Personally I am amazed that “solar science” has effectively managed to ignore the observations of Sir David Brewster for about 175 years… anyone actually making observations must have been tripping over spectrum inconsistencies all the time… perhaps that’s why the invented a “standard solar spectrum”.. I really don’t know. Settled “solar science” has clearly demonstrated its inadequacies during the solar cycle 24 prediction debacle… the understanding that they have just ignored Sir David Brewster for all this time is simply gob smacking… and it will be interesting to see how they respond [if at all] because it looks like they have a mountain of theory [and models] built upon spectrum absorption lines that might tell us a lot about the particles in the solar wind and the Earth’s atmosphere but not so must about the Sun. Others don’t… so I look for real data so I can see with my own eyes whether “theory” matches “reality”… and in the case of the “solar spectrum” it appears that “solar science” is not living in the real world. So what is the point Tallbloke? The TSI at the TOA is like the spectrum shown in the spectrum at the top of he page. It is the TSI at the TOA that is the ‘input’ to the climate system. Any modifications to the TSI BEFORE reaching the TOA are academically interesting, but don’t change how the TSI at the TOA influences the climate. What part of this do you disagree with? Why would you need to know the spectrum coming from the sun, when you already know the spectrum when it arrives at the earth? 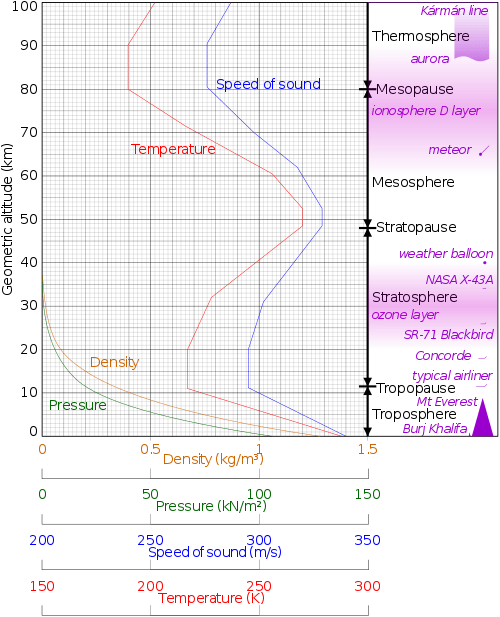 [Reply] Because nobody knows what the effect of the 30% shrinkage of the thermosphere (which extends well beyond the 645km orbit of SORCE) is going to be climatologically. And nobody has provided a new spectrum to compare with the old one since the sun went quiet and the thermosphere shrank. Where’s your scientific curiosity? Because energy transformations [via absorption, emission and collision] are happening in the lower atmosphere… and these transformation are not included in the “settled science” energy budget. First issue: “UV is converted to visible light”. YES – without a doubt. It contributes to airglow [and nightglow]. I also think the “Ionized-air glow” contributes to “airglow”… as does inelastic collisions between electrons and Hydrogen… this is a whole area that needs to be opened up and examined. 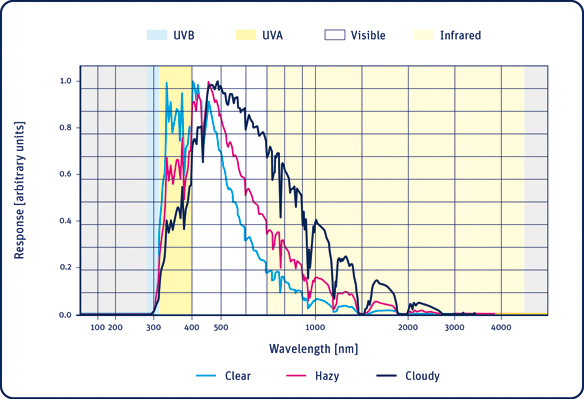 The “cloudy day” spectrum shows the absorption of UV and the emission of visible and infrared. Cloudiness is evidently associated with this transformation. What particles actually effect the transformation [and how] requires further investigation. However the “airglow”, “Ionized-air glow” and “inelastic collisions with electron” phenomena provide some very helpful clue regarding the emission of visible light. Photodissociation provide a good clue regarding the enhanced infrared emissions. But the whole are needs further investigation to pin down what is exactly happening. The electron is excited into the fourth state by a collision with another electron, then it goes back down to the second state and emits the turquoise photon. Then it quickly returns to the ground state, emitting a UV photon which our eyes are not sensitive to. Other lines come from other transitions. Each element has a different set of energy levels, so it absorbs and emits different photons and thus has different lines. That’s odd, Tim, you responded to one of my comments from another thread here in a thread I haven’t responded in, but just for clarification: Jupiter and Saturn have cores the size of terrestrial planets. If you stripped enough of the atmosphere from either you’d wind up with something that looked a lot like Venus at some point. Back to the thread, fascinating bit of insight, Tim, bravo! Err, note that the first “That’s odd, Tim” was “Tim F” and the second was “Tim C”, herp. Thanks for your reply. I now understand better your point about the necessity of understanding the “true” energy coming from the sun when working on the energy balance problem. Still, I have a couple of confusions. Since Trenberth et al misunderstand that some SI is not present in the identified spectrum of radiation, the underestimate the “in” side of the equation. They would then find the Earth warming anomalously, and have to believe that the additional warmth was a delayed release of energy, i.e. 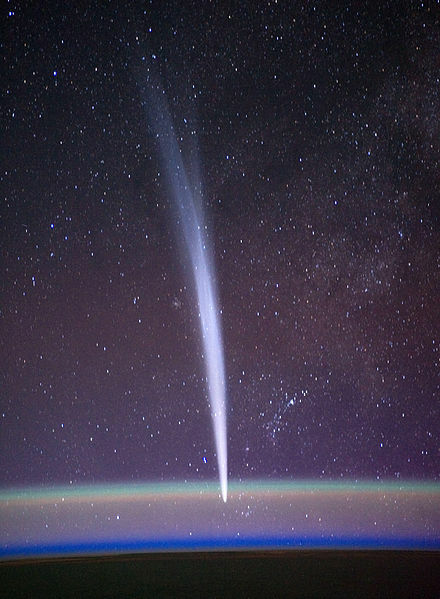 a CO2 or equivalent slowing down the radiative release. However, what they measured leaving the Earth would be unaffected; over time the measured radiative release would not change if total SI did not change. Their conclusion would be that additional CO2 did not have an increasing effect in keeping the heat energy within the atmosphere and surface material of the Earth. This would cause them to have a problem with CO2 theory as posed by the IPCC. As for the effect of the energy transference of >645km to <645km, you are discussing only (?) two ways of adding energy to the Earth system that are not accounted for: kinetic transfer of standard atmospheric components at the 645 boundary, and particle transfer into the <645km How significant are these two? Trenberth couldn't find about 0.58 W/m2, which strikes me as a ridiculously low number, while I have difficulty believing is within the error bars. The number you are considering must be breater than that, I would think, otherwise it is not meaningful in a practical way. Within atmospheric physics there is a very high need for accuracy and precision. Within the climate change debacle, perhaps there is more of a practical problem. You didn't mention the Mauna Loa Transmission declineissue I brought up. Nor the apparent TSI increase of the 645TSI. Have I misunderstood both of these graphs? Unless one thinks that the Earth has an immediate response to TSI, then changes will work their way into the system in complementary and contradictory ways. The AMO/PDO does seem to show that oceanic systems accept and release energy cyclically. An accurate energy balance would be determinable only after a series of cycles, whatever they might be. And the important aspect (WRT climate change) is the change in measured input. Unless you have determined that the non-measured portion is not proportionately related to the measured portion, if SI is the prime variable for the global temperature, then whatever the measured SI is will be locked together with the temperatures. Perhaps I am being too bottom-line here. Tim Cullen, quite right, the actual spectrum of course is very rough and doesn’t follow any idealized Planck curve but I’ve spent some time with that third graphic above with the 5777K curve overlaid and I always say to myself, wrong, that must just be the effective curve with the same area as underneath as the sum total of each rough line. I just mentally draw a higher curve with a peak at the 485nm line matching height and a bit to the left so it completely encompass all lines, for equipartition will keep any lines from piercing the top of that more actual Planck curve unless they are from a secondary source or modified at some later time crossing space. All of those near ir lines should also fit completely under the Planck curve to give you the actual temperature. Oh, the 6000K lamps, they were used to exactly mimic noon clear sky radiation calorimetric wise and they also compensate to mimic the blue sky component so they were never exactly as if compared in empty space. The industry I spent my first couple of decades dealt in exact colors. You had to be able to take a sample under these artificial lamps, exactly matching colors and then be able to walk outside under a clear sky at noon and have close to zero color shifts present. You are also right that often 6000K was just a bit on the warm side and something like a 6100K or 6200K would have matched it even closer. If we just had a perfect sun with a perfect black body spectrum and lights would have made our work so much easier. This is a good point to dig into, good article topic. ‘Climatology’ is far too inaccurate in so many areas for me, no wonder no one can say something is correct or not with just two digits of accuracy in so many base parameters! Seems that the assumptions and extrapolations in Climate Science are judged “good enough for government work”, and then “legislated” into place. Lawbreakers and nitpickers beware! It could also be associated with a decline in UV being transformed into visible light. b) Indirectly with the transformation of the Solar Wind into UV in the geocorona. This implies that the “transmission” concept is misleading… for example if you compared 645kmTSI with a “blue sky” 0kmTSI you will probably find that more visible light and infrared arrives [in some ranges] at the surface that was actually incoming at 645 km… likewise there will probably be a loss in the UV spectrum. I am not sure that we really know if any insolation arrives directly [at the surface]… even “reflected” light has to be absorbed before it is emitted back into space… it could be that everything is absorbed somewhere along the line… the absorbed insolation could then be remitted [without significant loss] or partially transformed or totally transformed… we really know very little… the “cloudy day” spectrum [for example] shows enhanced visible light and reduced UVA… so we have a transformation of energy… we might have “clouds” acting as a prism and “defusing” white light into all the other colours of the rainbow. I would suggest that the apparent contradiction could be associated with the Solar Wind. The Earth system has two inputs that predominate: Insolation and Solar Wind. Atmospheric transformations started being written out of the “science” script to accommodate the Ozone Hole Hoax… the script has since been redrafted to accommodate the CO2 Global Warming hoax… So there is a lot of backtracking to do… unravelling fact from fantasy… before we can start to make any real progress. My ignorance in many things amazes even me. Perhaps I misconstrue or misunderstand. My perspective is: always question… always look for observational raw data. Now the “quick and dirty” post-normal guys get funding by manufacturing “danger”. This Christmas I am going to the Big Island. Outside of watching lava flow into the sea (and walking on peridot-sand beaches sourced from 3.5km straight down) I am going up to the Mauna Loa Observatory. The MLO is Point Zero of CAGW in a sense, as the CO2 monitoring there is what drove the “concerns” originally. They are also associated with the pH measurements of the adjacent ocean that are the secondary concern of the warmists. I am going up to the Mauna Loa Observatory. Doug, will you get a chance to visit the Keck Observatory on Mauna Kia? Trying to quantify the “bottom line” is very difficult because the scientific literature predominately assumes that the measurement of TSI in the “satellite age” is “settled science”. Climatologists, especially, accept the “satellite age” measurement [and reporting] of TSI and conclude [based upon this “settled” assumption] that solar variability should be [generally] ignored when considering the causes of climate variability. However, if we search back through the literature there are references to the terrestrial measurement of TSI [before the “satellite age”] ranging from 1,322 to 1,465 W m2. Measurement of the absolute value of total solar irradiance (TSI) is difficult from the Earth’s surface because of the need to correct for the influence of the atmosphere. Langley (1884) attempted to minimise the atmospheric effects by taking measurements from high on Mt. Whitney in California, and to estimate the correction for atmospheric effects by taking measurements at several times of day, for example, with the solar radiation having passed through different atmospheric pathlengths. Between 1902 and 1957, Charles Abbot and a number of other scientists around the globe made thousands of measurements of TSI from mountain sites. Values ranged from 1,322 to 1,465 W m–2, which encompasses the current estimate of 1,365 W m–2. Foukal et al. (1977) deduced from Abbot’s daily observations that higher values of TSI were associated with more solar faculae (e.g., Abbot, 1910). If we compare the maximum “terrestrial” measurement of 1,465 W/m2 with the maximum “satellite age” measurement of 1,412 W/m2 we find a difference of around 50 Wm2. The actual direct solar irradiance at the top of the atmosphere fluctuates by about 6.9% during a year (from 1.412 kW/m² in early January to 1.321 kW/m² in early July) due to the Earth’s varying distance from the Sun, and typically by much less than 0.1% from day to day. From my perspective a discrepancy of 50 W/m2 is worthy of further investigation. From my perspective we still have a lot to discover. I might be wrong. Unfortunately, we don’t really know. The science is not settled. 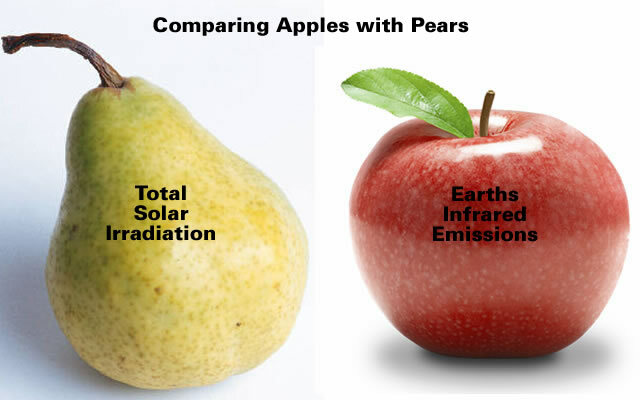 Reviewing some of the scientific discoveries made since the nineteenth century we find that solar irradiation travels through many particulate layers during its 8 minute journey from it’s “point of departure” [the Sun] and its “point of arrival” [the Earth]. The possibly that solar irradiance is modified “en route” seems to have been observationally confirmed by the many “satellite age” discoveries that have been made using spectroscopy [“the study of the interaction between matter and radiated energy” – Wikipedia]. Perhaps, if SORCE measured Total Solar Irradiation and Total Terrestrial Radiation [at an altitude of 645 km] then we could start to understand the electromagnetic radiation “budget” for the atmosphere below 645 km. The orbital variation in TSI is significant, especially wrt the 0.58 W/m2 that is alleged to be “missing” in energy balance equations. Will the timing of this variation, as it coincides with the different poles facing the sun, if they were to have significant cloud cover variations over several years, bring the variation in surface SI into the <1 W/m2 range? There are maps of cloud variation of the planet by cloud type and amount over the last 30 years. The data distribution is not good. There seems to be about a 15% decrease over the south pole and increase over the north pole, but the timing of these changes was not mapped. Less clouds during the summer over a pole make the ground warmer, while less during the winter make it colder. And vice versa. If they are equal throughout the year you will not be neutral, however, because the difference with incoming will be greater than the outgoing because it is dark during the winter, i.e. nothing is coming in. But if changes in cloud cover are only happening during one season, then you could have a hot summer and a normal winter, or vice versa, which would skew the annual record. The math is too complicated for me. I've tried to figure it out and got to the point that I was confident that a few percentage points of cloud cover variation over the poles during only part of the year, with the difference in TSI due to apogee/perigee positions and that the poles have a lot of time in either near full sunshine or near full darkness, was of the Trenberth missing heat level. But, as I said, it was ultimately too complicated for me. I was in the Arctic during July a couple of years ago, by the way. The winter ice was well observed to be walkable/driveable to 3km instead of 10. We had thunderstorms while we were there, which the non-Inuit said they hadn't had for 30 years. Not saying it is AGW, just that the changes are real. Oh, and AGW didn't kill off the caribou herds of 50,000: guided hunters killing the alpha males did it. And there is no shortage of polar bears. You mentioning TSI for some reason tripped me into taking a quick look at current SORCE data but this time I did something different… then starting thunking, oh yes, ghastly thunking noises. Something I think is very interesting has turned up. I was well aware the TSI data contains both at true earth distance and the usual one used at 1AU. Been here before. This time for some reason I decided to play around, enough turned up to make a fair blog article. This is a call on general blog traffic and wishes. After having read most posts in this thread I want to thank you for your own interesting posts, your care for scientific methods, your openess to lack of knowledge and your efforts to answer questions in a serious way. I couldn´t agree more to your first sentence below. Raw data is what always should be treated by independent scientists to be able to interprete what type of valuable information and sources of errors a data bank contains. Unfortunately it mostly means a lot of work and competence at hand. It is a pitty that a serious scientist have to deal with the rest of your quote below but that seems to be the reality we live in. Scientists are no saints by some are more honest than others. November 30, 2012 at 1:15 pm Ref. 50 Wm2 difference. I quite agree with the values quoted and our calculations (www.solarchords.com) fits this variation perfectly, how? why? Newton’s revelations resulting in F=ma means that whether you are describing a spinning flywheel or the solar system dynamics due to gravity, the end result is that in any defined rotating system in balance, then everything orbits the common center of mass (Barycentre) of that system and, taking into account the Hill/Roche sphere affect, this means that everything within the influence of the Sun, about 1.25 light years, orbits the Sun, or to be more precise, orbit each other, about the Solar System Barycentre (SSB). This gives rise to the IAU, that is the average distance of the Earth from the SSB, to be very precise, it is the average distance of the Earth/Moon Barycentre (EMB) from the SSB. Also the Sun has its own unique orbit of the SSB with an average period of 10.5 years. This means that the true Earth to Sun distance is the sum of the all three elements i.e. Sun to SSB + EMB to SSB (AU)+ Earth to the AU position. Due to the orientation of the solar system this gives rise to an additional variation to the TSI values you stated but it much more complicated than just adding this variation, as the the value is constantly varying with the distance and is not only highly regional in nature but due to the shape of the Suns orbit, also results in a concentrated solar forcing element as well. The TSI normalisation formula that I have seen, use only the AU and ignores the Sun’s orbital differences, this is where the 50 Wm2 has been lost/hidden. Our web site gives a full explanation of the math and logic together with the unassailable correlation with both historic climate events and climate proxies.